Even if you’re creating only one page using Adobe Dreamweaver CS6, be sure to create a site. A site gives you an organized method of keeping together images and other assets and offers additional options for managing those files. In Dreamweaver CS6, choose Site→New Site. 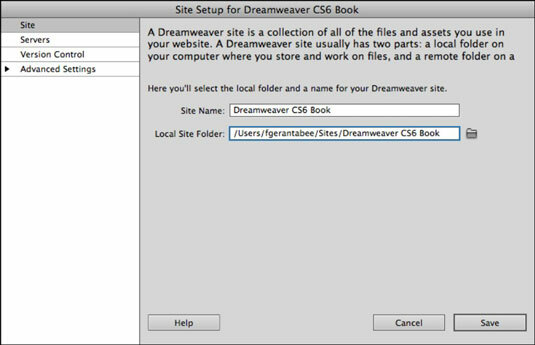 You can also choose Dreamweaver Site from the Create New column of the Welcome screen. The Site Setup dialog box appears. In the Site Name text box, enter a name for the site. For example, if your site’s focus is on bikes, you might name the site biking. To change the local site folder, click the Folder icon to the right of the Local Site Folder field and select a new location or choose an existing folder. The local site folder is the path where your new site folder will be created on your computer. It’s where your site files and pages will be stored from this point on. Click Save to create your new site. 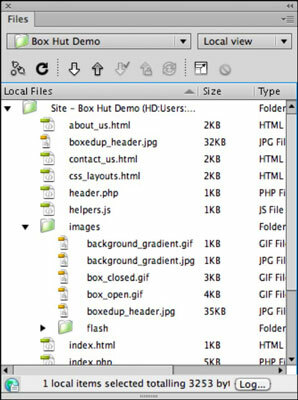 As soon as you create a site, your site folder is waiting in the Files panel. Think of the Files panel as the control center for all your files, folders, and other assets, such as images, sound, and video that you use to create your website. You can use the Files panel to view files and folders, whether or not they’re related to your Dreamweaver site. You can use the Files panel to do typical file operations, such as open and move files.